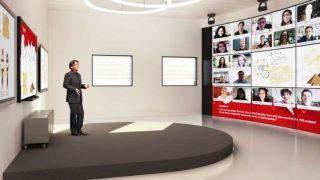 The What: Barco has launched weConnect, a collaborative learning solution for higher education designed to offer an active, lean-forward experience for everyone involved in an educational setting. The What Else: Consisting of just a couple of simple building blocks, Barco’s weConnect is a cloud-based system, unencumbered by complex infrastructure. All users gain access to the classroom system through a web-based cloud app. The app gives teachers full moderation control of the content shared within the classroom, and students get a close-up view of what is being shown on the classroom displays. Barco’s wireless presentation and display nodes portfolio enables students and teachers to share their information on the central screen or the pod display without any hassle. And both teachers and students experience the flexibility and intuitiveness of the software via the simple browser interface. Lectures are transitioning from a lean-back, unidirectional information dump to an active, interactive exchange among all participants. New technology has opened up a vast range of new engagement and collaboration possibilities. And while students and teachers want to bring any personal device (BYOD) into the room and tap into the campus Wi-Fi network to share information and interact more actively, students can also be located anywhere (e.g. in a remote classroom or at home), so the same features need to deliver an on-campus experience to everybody involved. Designed for students who have grown up with mobile technology, weConnect provides teachers with a new palette of tools for making their preferred teaching methods state of the art. The Bottom Line: weConnect is designed to give both teachers and students the connectivity, interactivity, and information exchange tools they need to enable educational institutions to evolve from a teacher-centric to a student-centric experience and make education more engaging.